It's such a soul-satisfying pleasure to indulge in soft, warm pretzels, fresh from the bakery. Mmmmm, what a treat, and how those coils of dough bring back wonderful pretzel-filled memories of a trip to Bavaria. I spent two weeks with friends who were working there, and I ate with enthusiasm the entire time, everywhere we went. I reveled in the opportunity to experience first-hand the food of my Bavarian roots, comparing each dish to Mom's or Grandma's version of the same. But the memory of warm pretzels, grainy mustard and a pilsner of cool beer also reminds me you can enjoy comfort food and good company in any locale. A neighborhood shop, Columbia City Bakery, offers fresh pretzels and pretzel knots every day, and I'm tempted more often than I care to admit. 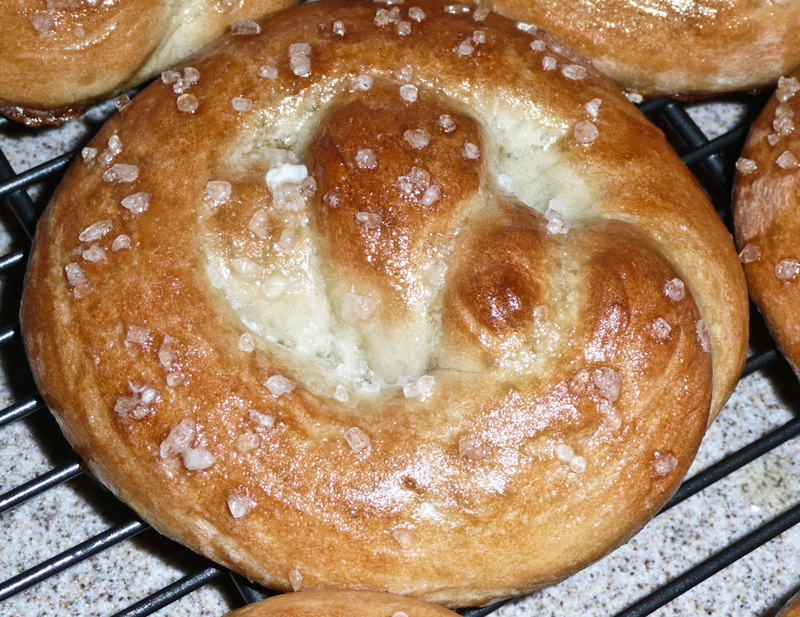 What's my excuse for not making my own soft pretzels very often? No excuse, they're easy and don't take long from start to finish. However, I think they're best eaten warm and fresh and there are only two of us to enjoy eight pretzels. That becomes an issue for the waistline. Now that I have pretzels on my mind, this could become a multi-batch week where I lure friends and neighbors in to enjoy an afternoon snack. Pretzels, mustard, cheeses, cured meats and pickles with beer - let's just call it happy hour or pre-supper event. You can use a stand mixer or choose to work the dough by hand. Place all of the dough ingredients into a bowl, and beat till well-combined. Knead the dough, by hand or machine, for about 5 minutes, till it's soft, smooth, and doesn't bounce back when you poke it. Lightly flour the dough and place it in a plastic bag; let it rest for 30 minutes. Preheat your oven to 500°F. Prepare two baking sheets by spraying them with vegetable oil spray, or lining them with a silpat or parchment paper. Roll each piece of dough into a long, thin rope (2 to 2 1/2 feet long) and twist each rope into a pretzel, shape. 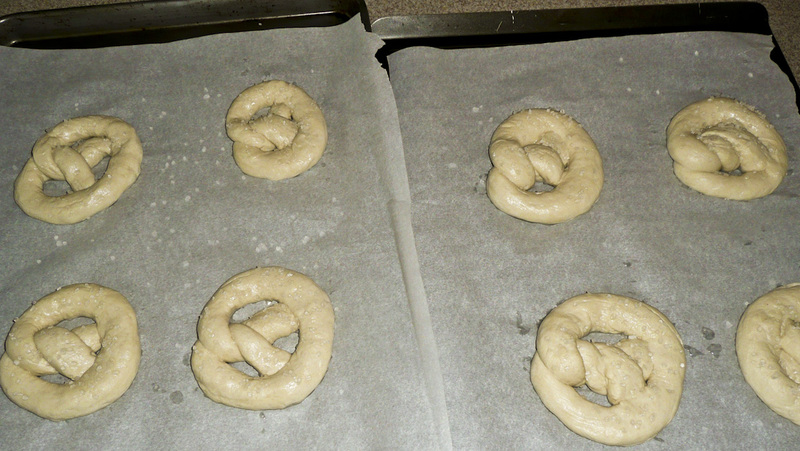 Dip each pretzel in the baking soda wash to give the them a golden-brown color, and place them on the baking sheets. Sprinkle them lightly with a coarse salt or sesame or mixed seeds. Allow them to rest, uncovered, about 10 minutes. Bake the pretzels for 8 to 9 minutes, or until golden brown. It helps to reverse the baking sheets halfway through. Remove the pretzels from the oven, and brush them thoroughly with the melted butter. Keep brushing the butter on until you've used it all up. I know , I know, it seems like a lot of butter, but it makes all the difference to the taste. Trust me. Eat the pretzels warm, or reheat them in an oven or microwave. Store them uncovered, or in a paper bag (not sealed in plastic) if you have any left. Want to nibble on a smaller bite? 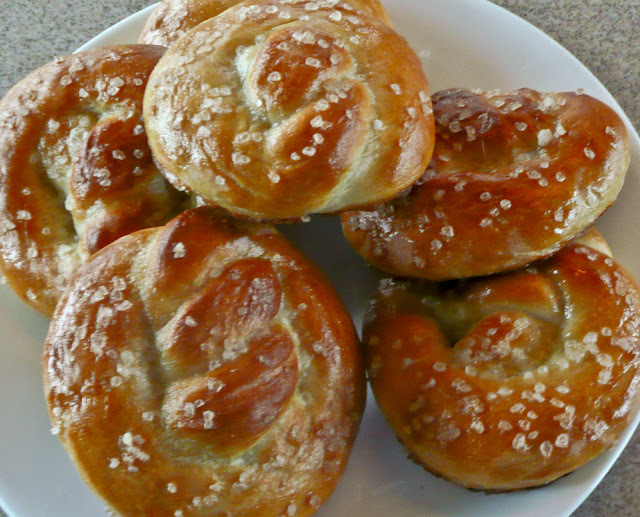 you could aim for tiny pretzel knots, but pretzel holes or knobs (think donut holes) are an easier solution. You might reduce the oven temp and cooking time a bit - experiment and keep an eye on them so they don't over brown. Visions of pancakes distracted me on Tuesday. It was Shrove Tuesday, Pancake Tuesday, Pancake Day, Fat Tuesday, Fasching... the Tuesday ending Mardi Gras or Carnival. Historically pancakes were a way to use up a family's supply of rich ingredients like eggs and butter - items that were traditionally prohibited during Lenten fasting. 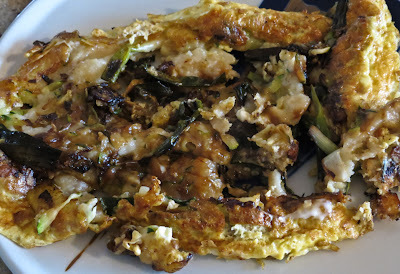 But I ignored sweet western-style pancakes and focused instead on savory Asian pancakes. Blame the internet for my pancake distractions, tempting me with post after post after post that raved on about those tasty, aromatic delights. A google search for recipes had me clicking away for ages, mentally sampling each variation. Some resembled crepes while others were closer to my notion of thin, savory pancakes. This Tuesday's pancake came from a David Lebovitz recipe, an adaptation based on ingredients available in my kitchen. His recipe was unusual by having an egg layer added separately from the pancake layer. 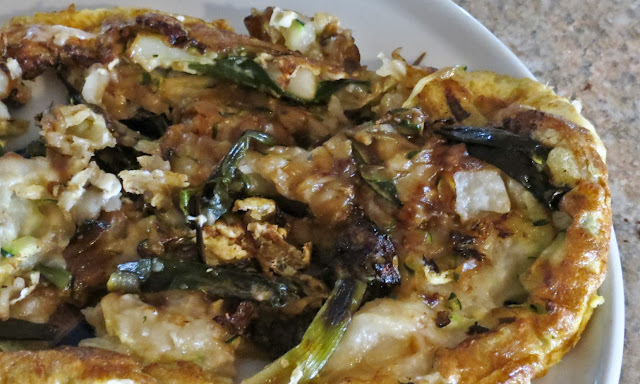 More commonly Korean Scallion Pancake recipes called for adding eggs to the batter mixture. The two-layer method sounded intriguing, and I do love fried eggs. This first attempt was more of a Korean puffy omelet instead of a thin, crispy pancake. Oops! It wasn't pretty, the kitchen smelled funny and my chief taste-tester would only try two bites. I was disappointed in the texture, frustrated by the two-layered approach, underwhelmed at the flavor and thankful I had not wasted any shrimp on my first try. This was not the pancake of my daydreams. Chalk it up to another learning experience. 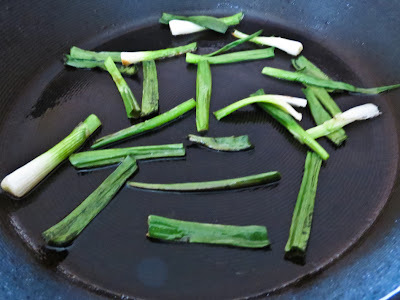 The Green Onion Pancake idea deserves another try; the Lebovitz recipe received many positive reviews from other cooks. If there is a round two with this particular recipe, I'll thin the batter some, use rice flour instead of AP flour, add fewer vegetables, skip the soy sauce or use it as a condiment rather than an ingredient, and either divide the same quantity of batter to make two pancakes or use a larger skillet. Then again, I might try a different approach (link). Sigh, I'll also have to find someone else to help me sample the results. Combine the flour, water and salt in a small bowl. Crack the egg into a small bowl and beat lightly with a fork. 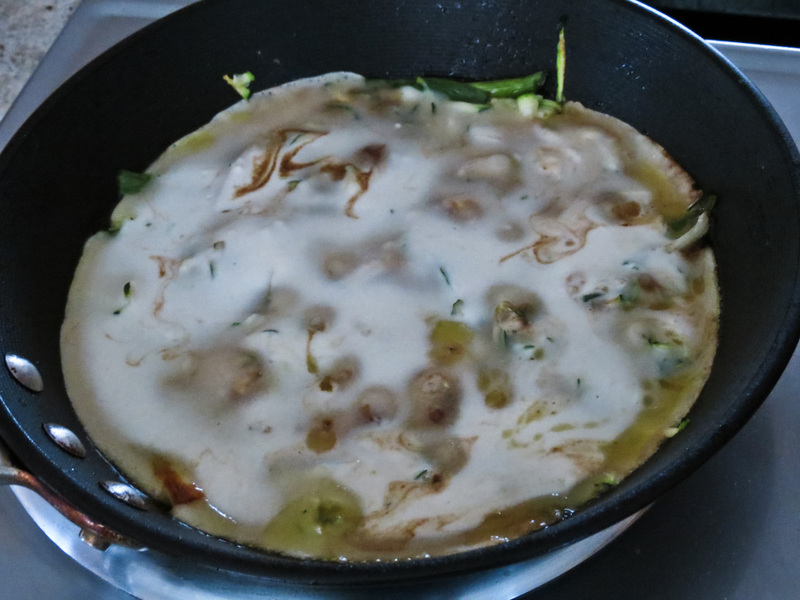 Add a tablespoon or two of oil to a non-stick skillet and heat over medium-high heat until shimmering. Add the onion pieces and cook until soft. If using soy sauce or other seasoning liquid add it to the pan now. Add any shredded veggies (like cabbage or zucchini, etc.) and seafood (perhaps sliced cooked shrimp or crab pieces); stir and toss briefly while they warm. Add the pancake batter to the pan, pouring it over the vegetable mix and tilting the pan like you would to spread omelet or crepe batter. Cook a few minutes until the bottom is golden brown. 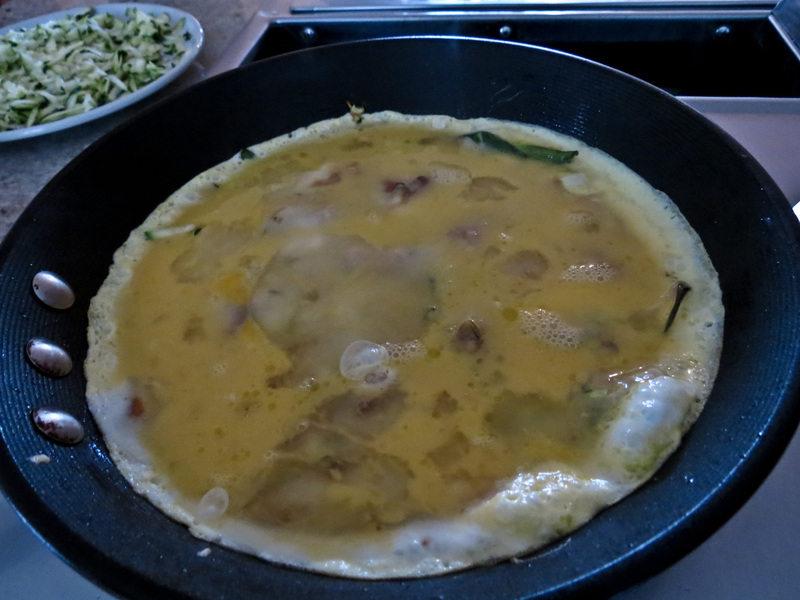 Pour the beaten egg over the top, again tilting and moving the skillet to spread it out. Cook until this egg layer begins to firm up around the perimeter. Remove to a cutting board and cool to room temperature. Slice into pie-shaped wedges and serve with a dipping sauce. Pan-fried deliciousness from everyday ingredients. As a youngster, a kid growing up in the Midwest, fish was not on my list of favorite foods. No way, not even at the bottom of the list. Fresh fish meant picking through gazillions of bones for each mouthful of dry, flaky, fishy-flavored flesh. Dad's favorite canned salmon croquettes were another unpopular (to me) dinner item. For years, fish cakes of any kind were mentally linked to those dreaded croquettes. Seafood slowly crept into my diet during my Southern California preteen years. Fish sticks with ketchup or bottled tartar sauce were tolerated at home and at school - probably because they didn't really seem like fish. Tuna fish sandwiches were an okay lunch choice, and tuna melts were an improvement. Seafood love finally struck me as a teenager with my first restaurant-ordered shrimp Louis or crab Louis salad. Iceberg lettuce, thousand island dressing and mountains of shellfish - what was not to like? And oh how I loved those cute little shrimp cocktail appetizers served in small juice glasses. Fish? I know I ate fish and chips, but it was probably the crust and the fries that thrilled me. Now, all these years later, I'm crazy about a variety of fresh, local seafood. Fresh and local are key words here. Public disclosure: here in the Pacific NW, where fresh seafood is so readily available, I've also discovered a latent fondness for fish cakes. 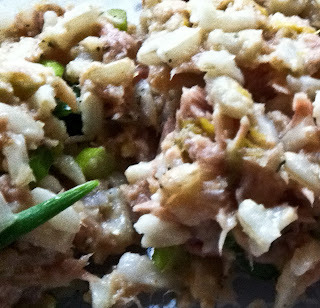 Whether cooked fresh fish or canned fish, both work for me in patty form. Go figure! The Daring Cooks' February Challenge was all about patties, and it refocused me on canned tuna and sardines. The various fish cakes I prepared made for delicious lunches and light suppers, not as rich as crab cakes and certainly more affordable. When we're cruising I'll continue to revel in fresh seafood as often as possible. 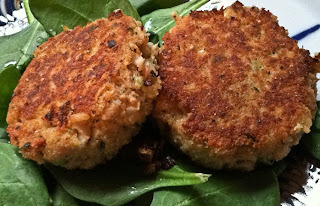 For my seafood cakes or patties I'll first use cooked seafood , fresh or left from another preparation, but I will also stock a few cans of tuna and sardines, just in case. are pan-fried until browned and crisp. 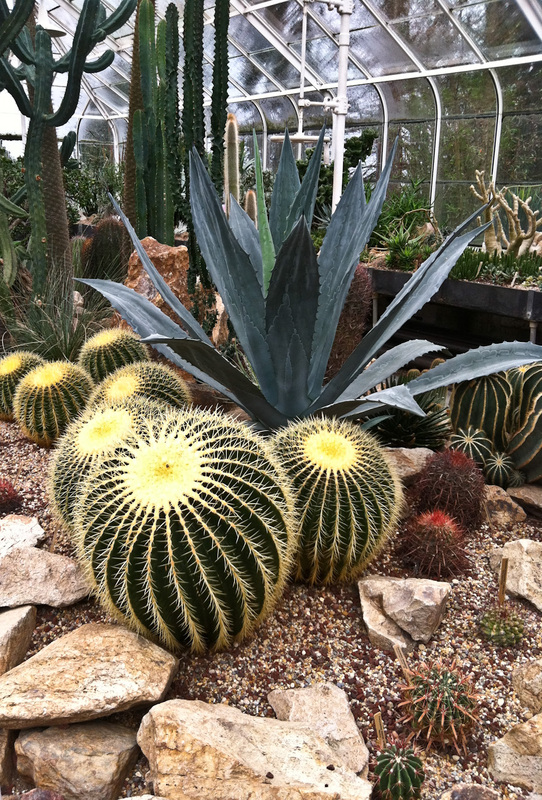 Mmmm, betcha can't eat just one! 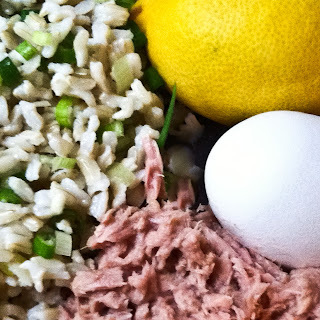 Mix the tuna, rice and egg in a bowl. Add breadcrumbs, a tablespoon at a time, until a small ball of the mixture holds together when pressed. Add the parsley, onions, kale, lemon zest and hot sauce and mix thoroughly. Use a well-seasoned iron skillet and heat a tablespoon of oil over medium heat until it shimmers. 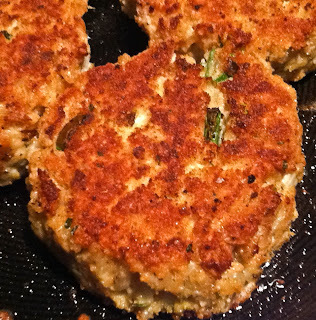 Cook a tiny sample fish cake until browned on both sides and taste for seasonings. Add salt, pepper, etc. as needed to the blend. Use a 1/4 cup measure to scoop up a portion of the fish cake mixture. Pack it firmly and unmold into a pie plate that holds the breading mix. 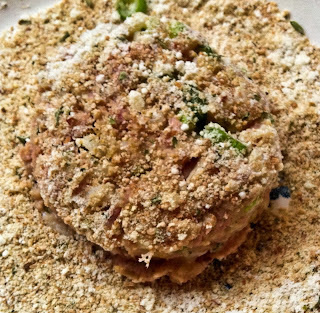 Cover both sides of the patty with breading mix and set aside on a platter. Repeat until you run out of fish mixture. Cover lightly with plastic wrap and chill in the refrigerator for an hour or so - it will make the fish cakes easier to turn when you cook them. 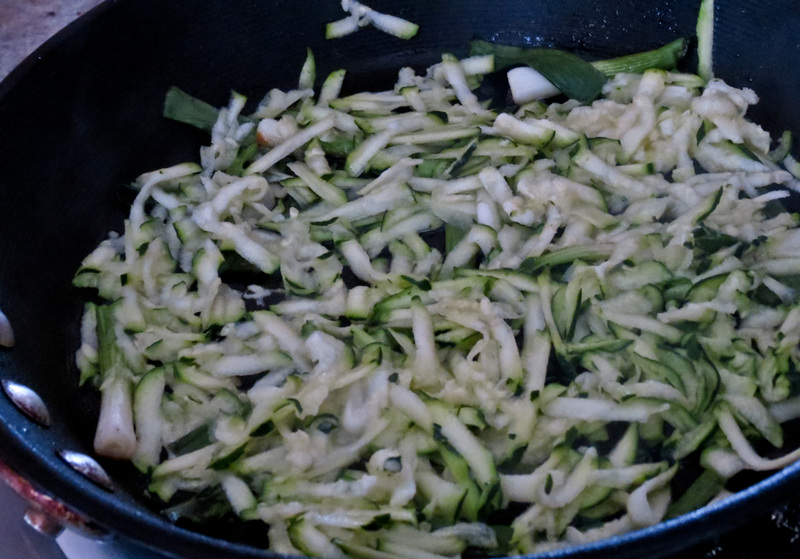 Reheat that well-seasoned iron skillet with another tablespoon or two of oil. 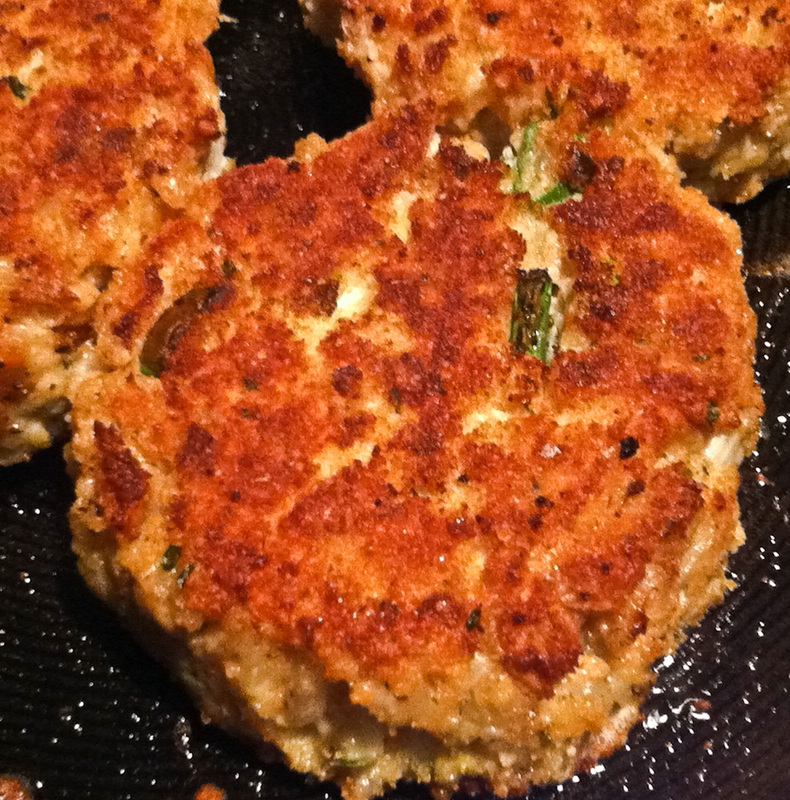 Gently place some fish cakes in the pan with an inch or two of separation between them. This way they fry instead of steam, and it makes it much easier to turn them over. Cook over medium heat until nicely browned on side one, then carefully flip and cook on side two until a crispy golden brown crust forms. * If you decide to freeze part of the batch, stop before breading the extras or you risk soggy crust when you do fry them up. It's better to defrost the patties, then apply the breading. I know, it's obvious, but it does make a difference. * Change up the flavors by substituting oyster sauce, or Thai sweet red chili sauce. Use corn or chopped green beans instead of spinach or kale. Get creative and see how a few different ingredients can make a huge difference in taste. 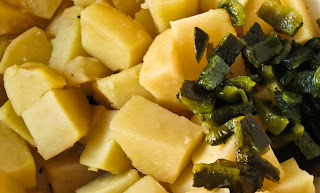 ...a mini post for a dish that's closely related to a recent favorite, Poblano Potato Salad. It's true, the same zesty, creamy sauce that was such a hit with potatoes has managed to transform cabbage slaw into a new taste treat. We like this flavor combination so much it could find its way into many more familiar recipes. Why was that such a surprise? Probably because I didn't think of it. This recipe was all RL's idea, inspired when he ran across a head of green cabbage sharing storage space with baskets of apples, oranges, clementines and a few avocadoes on a shelf in the cool room. The cool room, aka the garage, keeps produce in tip-top condition, stored on high shelving during our cool Seattle winters. That's a good thing, slowing the ripening process between shopping trips. It can also be a problem when an item hides out of sight and out of mind, like that one lone head of cabbage. Just imagine the layers of flavor and textures. Cool, creamy sauce mellowed the poblano's bite. Crunchy cabbage shreds were the perfect contrast to the smooth creaminess of the dressing. Lemon zest and juice balanced any potential heaviness from the mayonnaise. Pile some tangy coleslaw on top of saucy pulled pork with pepper jack cheese inside a crispy taco shell. Oh my! that's one good taco! And you know can't eat just one. 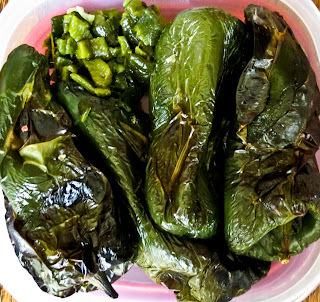 Prepare the poblanos, using more or less according to heat tolerance. 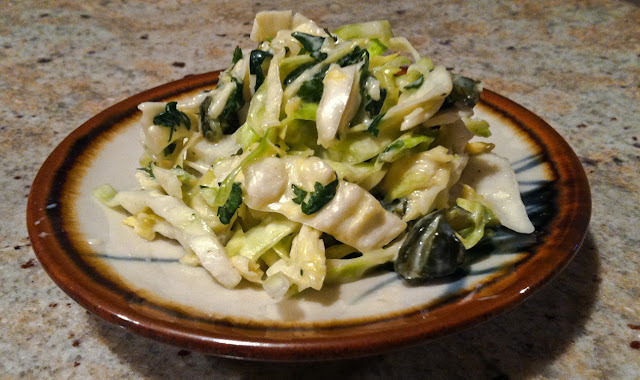 Shred the cabbage and place in a medium bowl. Add the cilantro and toss. In a separate bowl, mix remaining ingredients (except Cotija cheese) for a sauce, adjusting seasonings to taste. Add the poblanos and sauce, a bit at a time, and blend thoroughly. Add remaining chiles and dressing as needed to desired consistency and level of chile heat. Top with a sprinkling of crumbled cheese when serving. Daring Cooks: Flipping Fried Patties!!! This month's DC challenge selected a common food item, patties, prompting me to think about the how and the why of successful patty creation. Basic components, held together with binders of egg or flour, shaped into a disc and pan-fried in fat - that's a patty. Ah, but the differences in ingredients, texture and crowd-pleasing flavor are infinite. This should have been a simple matter, do-it-in-my-sleep easy, but I dithered around for days. Patties are so commonplace it was difficult to choose just one of the possible variations. So I didn't, instead I worked with several ideas. Entrees, appetizers and snacks - we nibbled on a lot of patties this month. 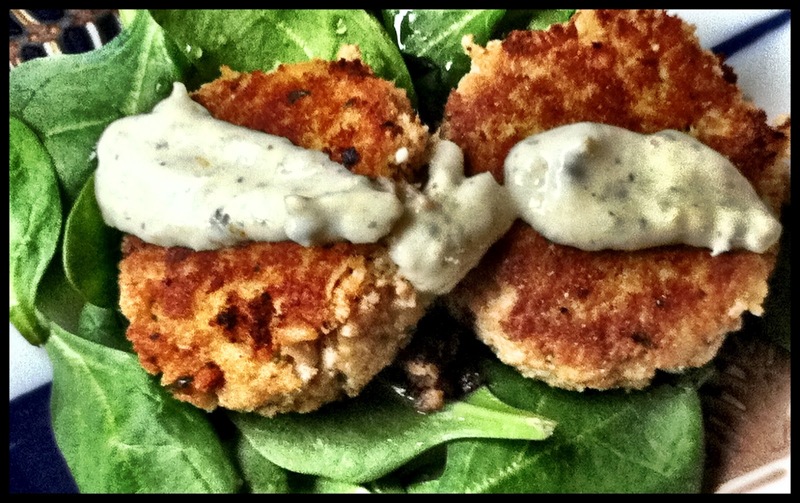 Think mini-burgers, hash cakes, fish cakes, vegetable pancakes, veggie fritters... I enjoyed the Patty Challenge, but I'm through frying anything for a while. Initially I grabbed whatever was available in the refrigerator and made Spicy Beef-Stuffed Pepper Rings. Tasty little sliders, pressed to fit inside red pepper rings were an instant hit, so much so I'll never bother to stuff a whole pepper again. 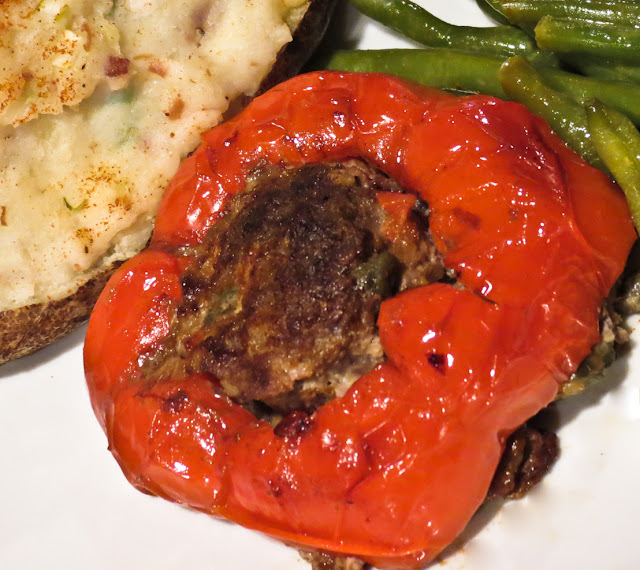 Pan-frying and flipping put a lovely, crispy crust on each side of the meat patty; a great improvement over the usual soggy, steamed lump of meat typically found inside a stuffed pepper. 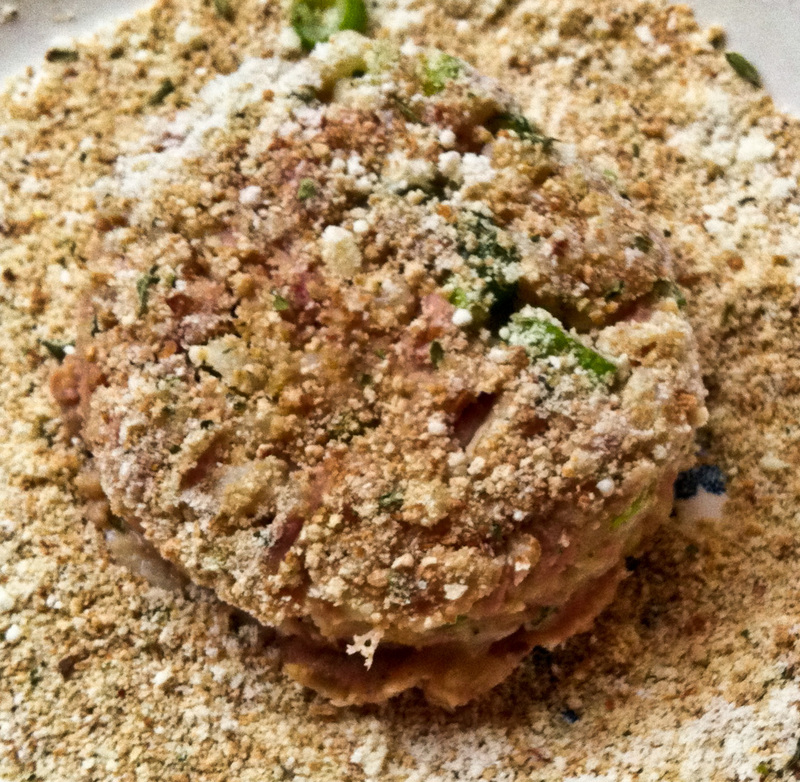 Freshly ground beef (thanks to the KitchenAid grinder attachment) combined with finely diced poblano and sweet red pepper bits, capers, garlic, Mexican oregano, cilantro, Spanish smoked paprika and a dash or two of chipotle tabasco for the basic slider mix. One large egg and a handful of toasted breadcrumbs worked well as binder. We'll enjoy this stuffed pepper ring presentation again and again. What, no specific recipe? No photos? Nope, the opening photo presents my impromptu riff on stuffed peppers, but there are so many more variations to share. Crab cakes and more crab cakes were delectable as appetizers. 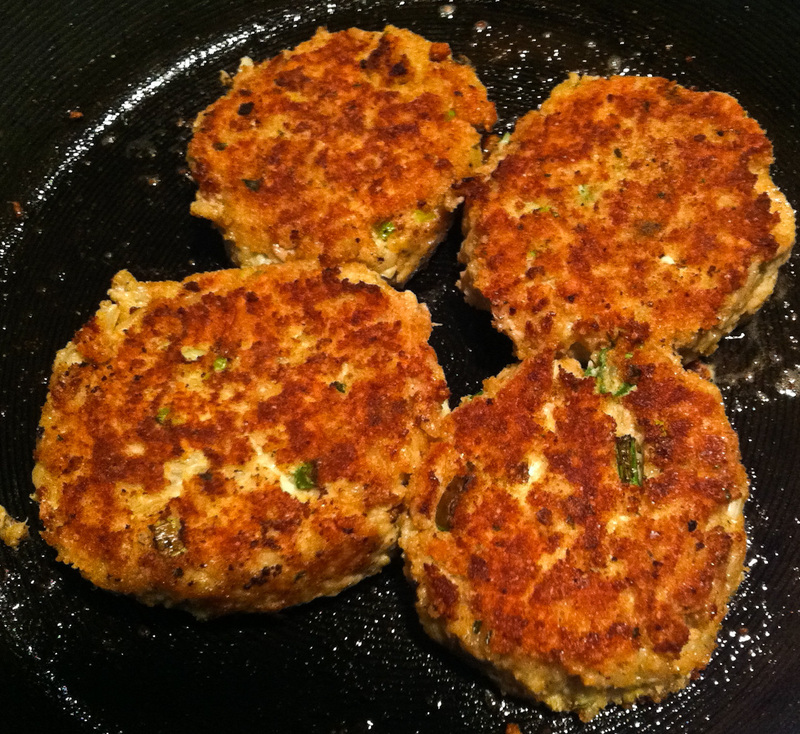 Merguez lamb patties began as mini-meatloaf and kefta recipes. Breakfast hash and chicken hash morphed successfully into scrumptious patties. Consider this an invitation to play with your food, to improvise with whatever is in your refrigerator and the seasonings you enjoy to enhance the flavor. Just form a patty and fry it up into a crispy palate pleaser. Go for it. 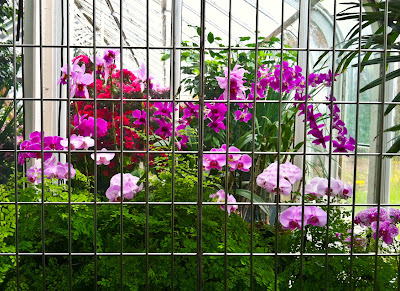 On a gray, drizzly day in Seattle it made sense to spend time touring the conservatory in Volunteer Park... and have lunch at the Volunteer Park Cafe, close by in the same neighborhood. The tropical plants on display were showstoppers, their vivid colors enticed us to linger a while in the comforting warmth of that humid environment. 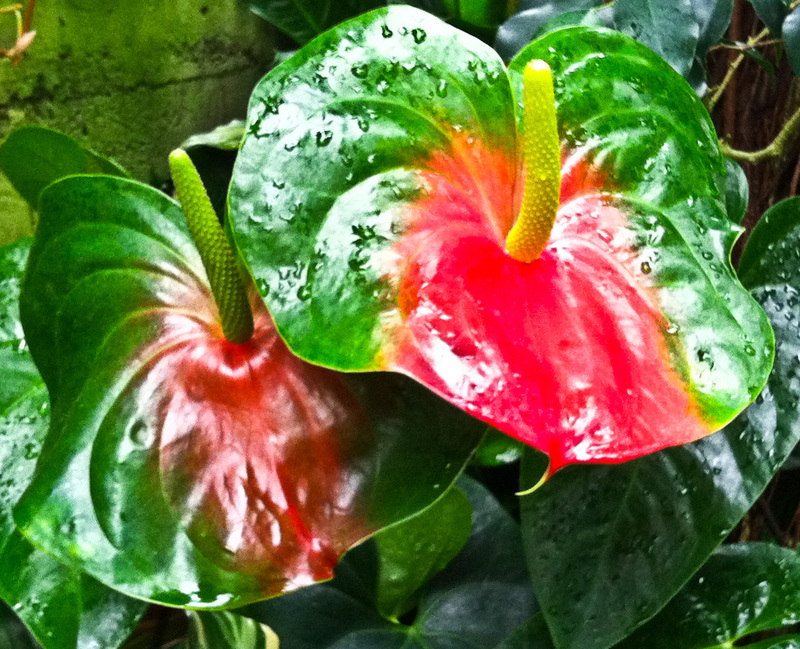 We were transported to Hawaii... almost. The cactus room was cooler, but who could resist such an attractive desert setting? 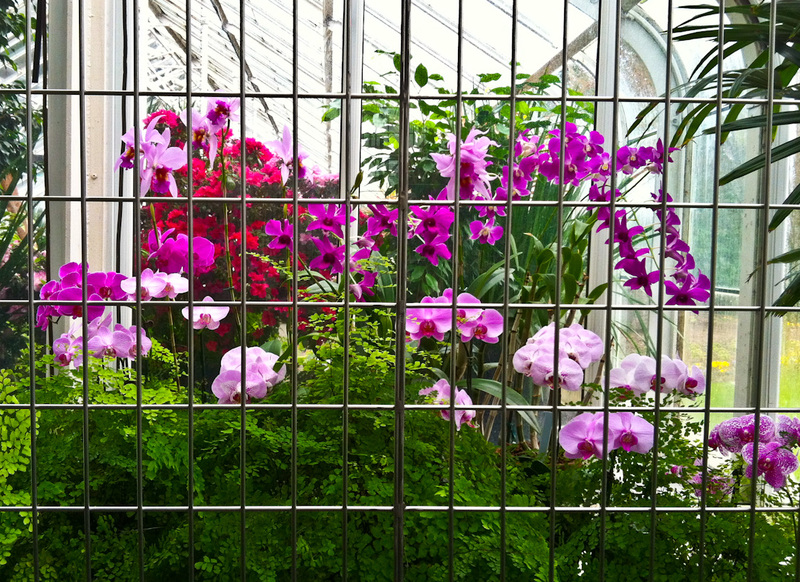 Visual treats are music to the soul, but Oh, my! that lunch had my taste buds humming a happy tune. The open-faced mushroom sandwich was a winner. 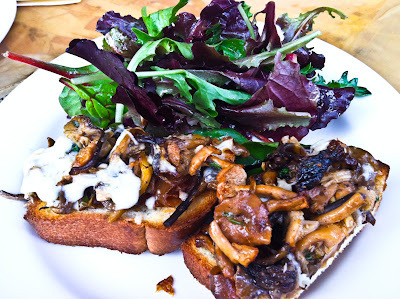 Herb-roasted mushrooms, onion jam and melted smoked jack cheese piled high on toasted brioche paired with a green salad dressed with a fruity vinaigrette. Yummy! 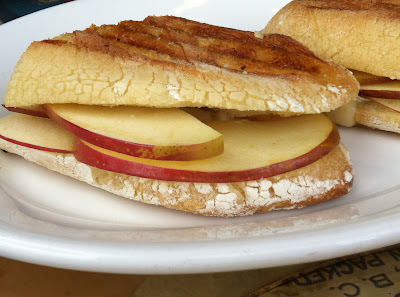 This sandwich is reason enough to return often, or make pints of onion jam at home. The Brie and Apple Panini, made with sweet red apples, brie and lavender honey layered on a toasted baguette, hit more of a dessert note. It was tasty enough to finish, but was too bland, even a bit boring after that wonderful mushroom sandwich. H. and I shared both plates, but agreed we wouldn't bother with that particular panini again. Give me one week of solid sunshine and I'm ready to launch into summer. It's barely February, not even close to Spring, yet I found myself daydreaming about summer fun, summer weather and summer food with strong, bright flavors. 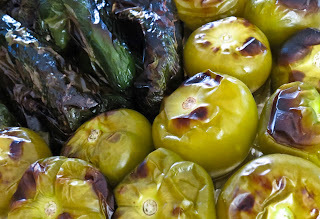 It helped too that the kitchen was overstocked with the fresh green colors of cilantro, tomatillos and Poblano peppers. So I roasted those green veggies and took a mental road trip into summer adventures. The aroma of roasting peppers filled the house, reminding me of a tempting recipe I had bookmarked months earlier. Bookmarked, and then resisted. Last June (link) I stated a preference for vinaigrette dressing on potato salad. Actually I ranted on and on, dismissing potato salads with a mayonnaise base as too goopy and weighty. 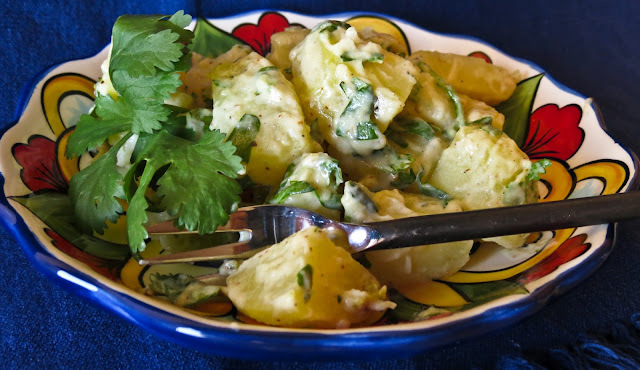 Then HomesickTexan featured a Poblano Chorizo Potato Salad post in July and I was tempted. Poblanos, chorizo, potatoes - who could resist? But it called for mayonnaise, so I resisted. Resisted until this week, when those lovely just-roasted peppers demanded star billing. So I worked on my version of that tempting bookmarked recipe. I roasted a dozen tomatillos and five peppers, knowing they could be used in several familiar dishes. While the online recipe called for two Poblanos, I only used half of one large pepper. It was hot enough to make it's presence known! You know the feeling, when your lips tingle a bit but you don't quite break into a sweat or cry. 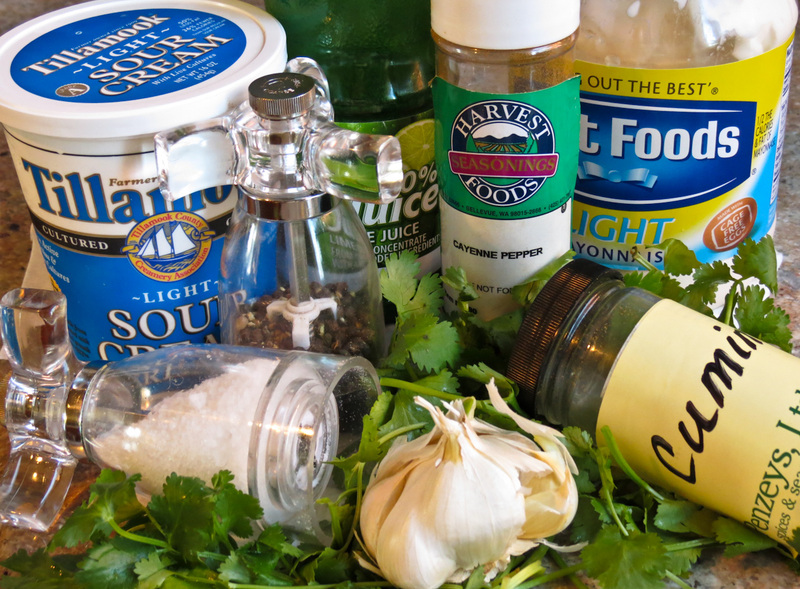 Basic kitchen ingredients combined to make a tangy dressing, not at all goopy or weighty. 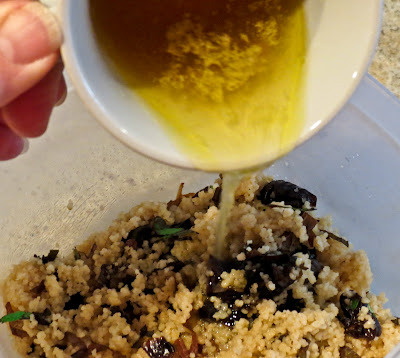 Cumin can be overpowering in scent and taste, but it played nicely in this dressing. The same can be said for the garlic. That vibrant green color hints at the flavor punch a Poblano can pack. Mmmmm, love those peppers! 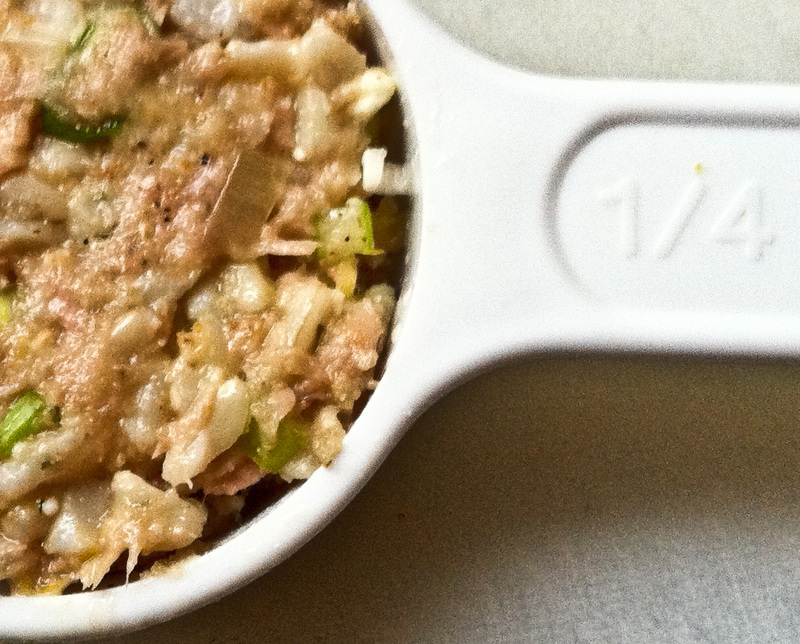 RL raved over this recipe, declared it his new favorite and promptly ate two helpings. That's translates to two thumbs up at our house. 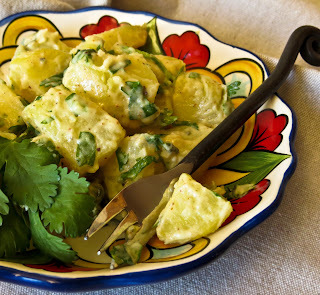 So now we have another "favorite" version of a sunny, savory potato salad. Every cook needs more than one great potato salad recipe in their repertoire, right? What's yours? Roast the poblanos under the broiler until blistered and blackened on all sides. Put the chile in a closed paper sack and let it steam until cooled. Then peel off the skin, remove the stem and seeds and chop the flesh into small dice. While the chile steams, put the potato chunks into a pot, cover with cold water, and bring to a slow boil over medium heat. Cook until just tender, then drain and rinse with cold water. Mix together the chorizo spice, garlic, cumin, lime juice, vinegar, mayonnaise and sour cream for a dressing. Place the cooled potato chunks in a large bowl; add some or all of the diced Poblano pieces and the chopped cilantro. Chiles vary in heat, so adjust to your own taste. Toss gently to distribute evenly. Add the dressing and mix gently to incorporate. Adjust the seasonings, you may want more lime juice or Poblano. (I used 1 additional tablespoon of lime juice, but only one half of the Poblano - it was really hot! Add salt and pepper to taste. Serve warm or chilled, it's delicious either way. Top with a sprinkling of Cotija cheese crumbles if you like. I'm not adventurous when it comes to cooked grains for breakfast. 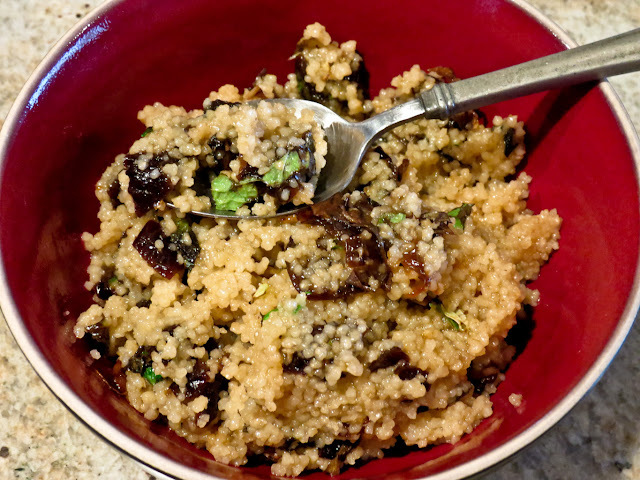 We enjoy long-cooked steel cut oats and enjoy an occasional bowl of quinoa or Red River porridge, but even with added dried fruit they seem pretty ordinary. Then I found a recipe that changed my attitude toward the whole cooked cereal breakfast scene. 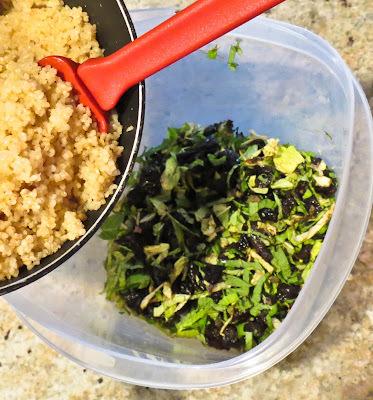 A breakfast tabouli recipe in Robin Asbell's The New Whole Grains Cookbook brought me to my Couscous for Breakfast recipe. Each month I check out piles of cookbooks from the local library, skimming each table of contents and flipping pages until a title or photo catches my eye. This one stopped me immediately. Sweet Tabouli? a cold salad included in the breakfast section? No, it's not really a salad and that's not the only surprise in this recipe. Asbell used apple juice for the cooking liquid instead of water, and that idea was a winner. A chilled or room-temperature version of the recipe would make a delightful lunch salad, but it's truly special as a warm breakfast treat. Warm or cold, it's delicious and the preparation is so easy it doesn't seem like cooking. Assemble the 4 main ingredients; measure and chop. 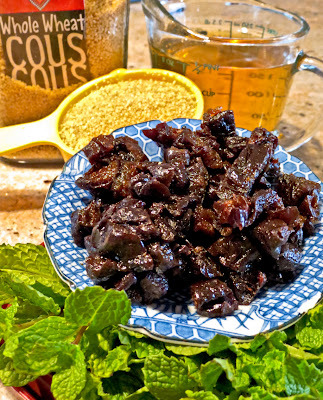 Mix the chopped mint and dried fruit. Stir couscous into boiling apple juice; cover and steam. 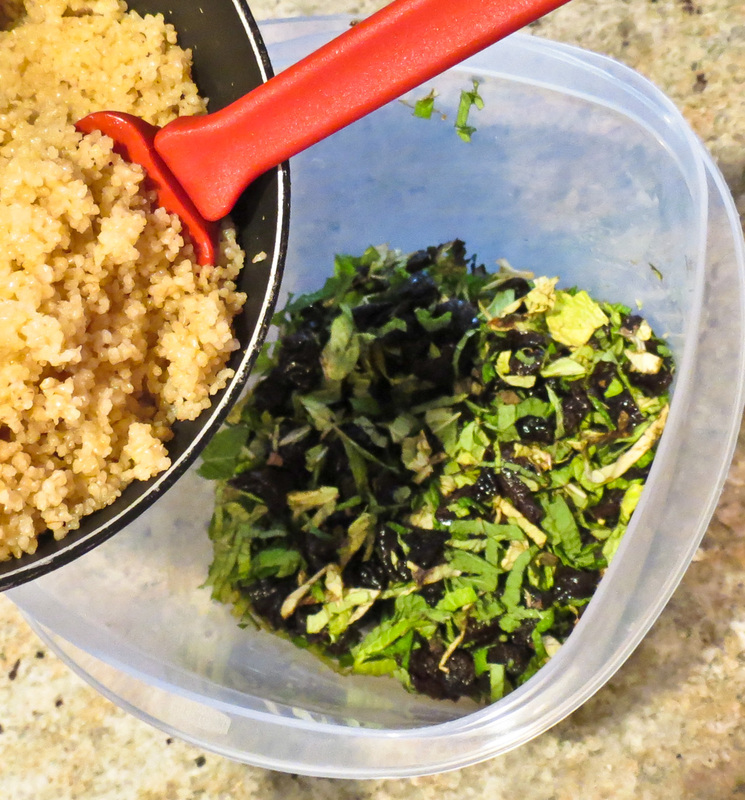 Add the now-cooked couscous to the mixed mint & fruit; cover and steam. Mix the lemon juice, honey and oil topping; add and toss. That's it - a few ordinary ingredients plus a few simple steps and you have a surprisingly sweet and fresh-tasting healthy whole grain breakfast. 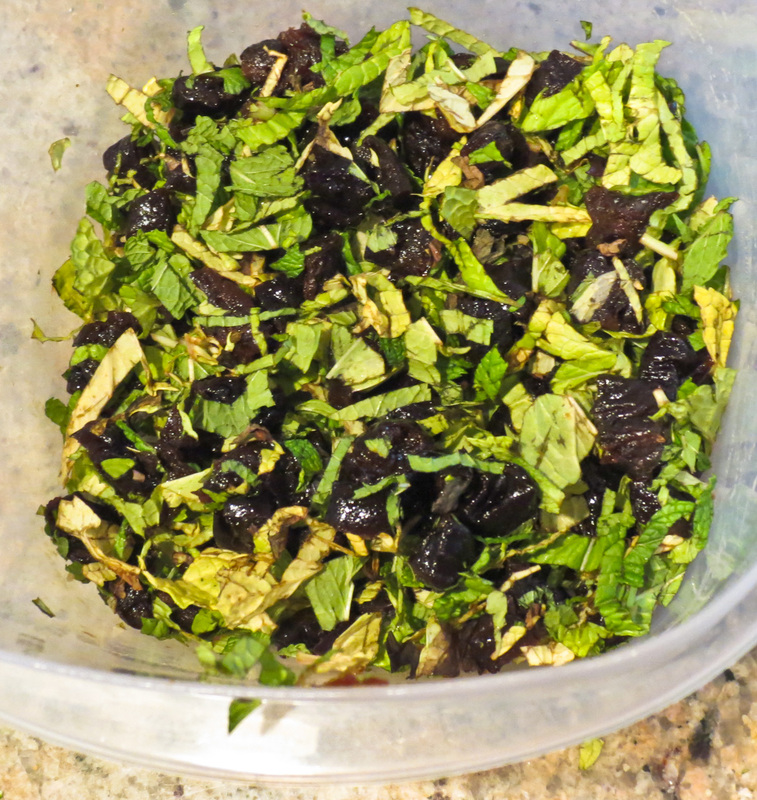 Dice the dried fruit and the fresh mint, not to small. 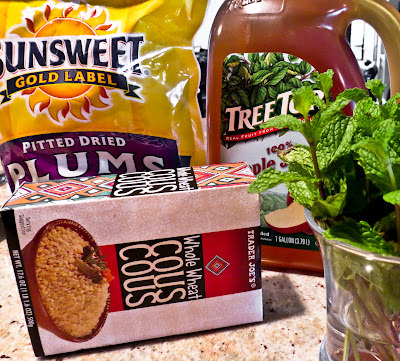 Place the chopped fruit and fresh or dried mint in a container with a tight-fitting lid. Bring the apple juice to a boil in a small saucepan. 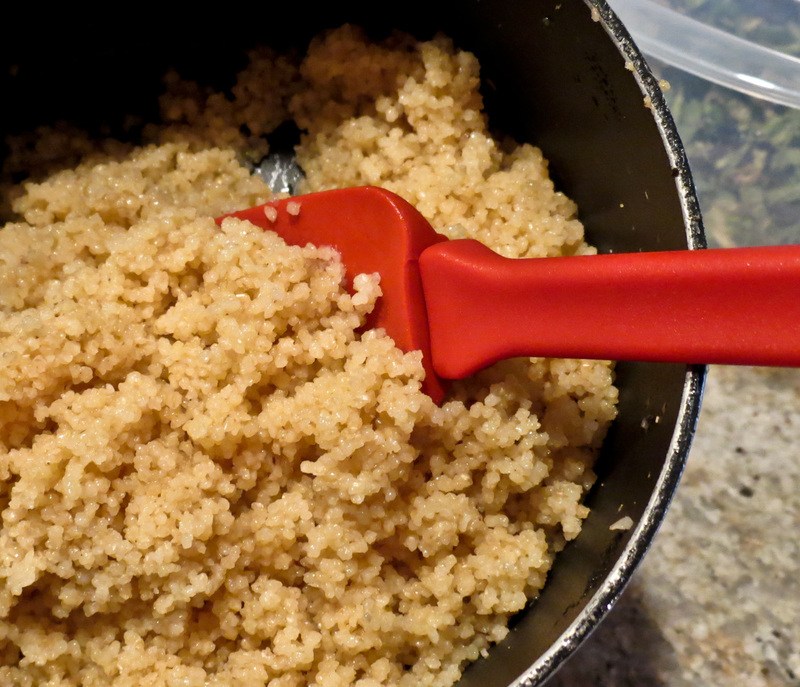 Stir in the couscous and remove from the heat. Cover and let sit for 10 minutes. 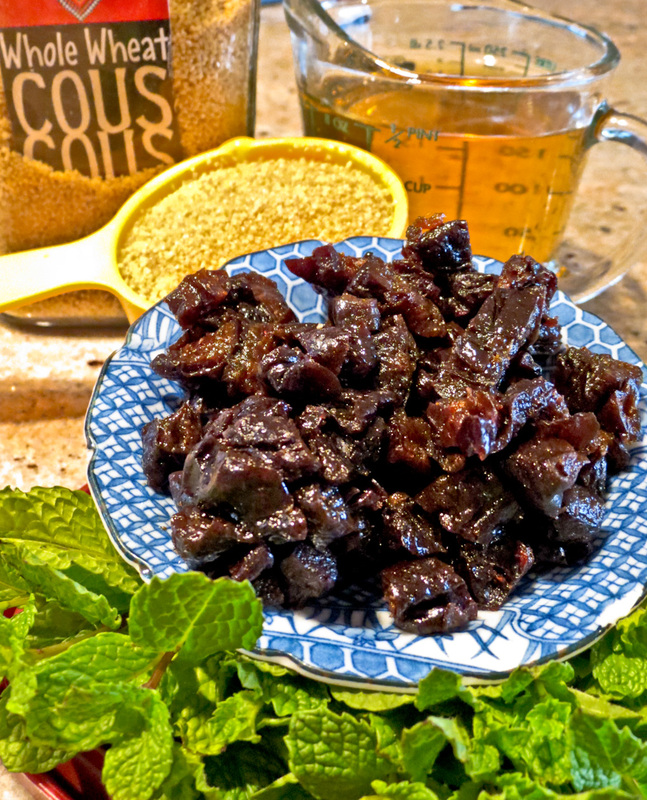 In a small bowl or cup blend together the lemon juice, honey, and oil. Drizzle this dressing over the couscous and toss to mix and fluff. Spoon into individual bowls and scatter nuts on top. Yum.